A recount at the Atlantic County Board of Elections upheld earlier results giving Councilman Frank Gilliam the Democratic primary win to face Mayor Don Guardian. 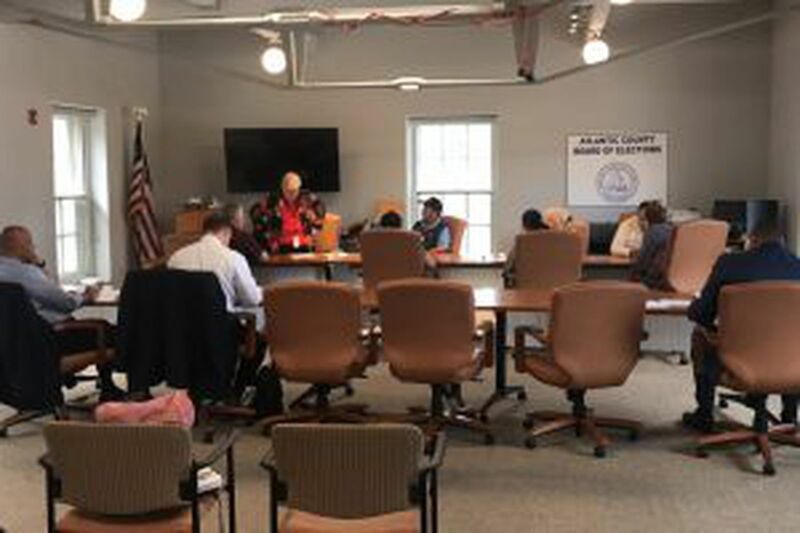 MAYS LANDING, N.J. — A court-ordered recount of machine and vote-by-mail ballots Monday did not change much in the Democratic primary held in the Atlantic City mayoral election. The recount of vote-by-mail and provisional ballots gave City Councilman Frank Gilliam a 728-249 edge over City Council President Marty Small Sr., a difference of 479 votes. Election night totals had Small winning the machine vote by 100 votes, 1,529 to 1,429. That was unchanged. The vote-by-mail tallies differed only by one for each candidate, but Small picked up 39 provisional ballots to Gilliam's 33, narrowing the non-machine gap by six votes. Gilliam claimed victory election night after watching Small tearfully address his supporters seemingly in defeat. Gilliam said after the recount in the old courthouse in Mays Landing that the process should go forward now in the general election campaign against Republican Mayor Don Guardian, 63, who won a surprise victory against Democratic Mayor Lorenzo Langford in 2013. "The process has prevailed," Gilliam said. He said his campaign had no role in securing any messenger or provisional ballots. Small, 43, has accused his opponent's campaign of paying people to be messengers for vote-by-mail ballots, of using addicts and alcoholics in that process, and of paying people $30 for their ballots. He said people were picked up twice a day outside the Atlantic City Free Public Library and taken to the Board of Elections in Mays Landing. "I knew coming into today there was a chance that the numbers would stay the same," Small said. "My gripe is how these votes were obtained." He said he would file an official election challenge. Superior Court Judge Julio Mendez has already ruled that Small is entitled to examine "registry books, voter authorization, mail-in ballots and mail-in ballot applications, rejected and late arriving mail in ballots, envelope flaps, outer envelopes, provisional ballots," and other items. Small was acquitted of mishandling absentee and messenger ballots in 2006 and 2009. After spending a quarter-million dollars on his defense, he said, "Do you think I'm going to let this go?"